It is, still, way cool. I can't imagine what it looks from your backyard. It was an amazing sight last night. I could see it from the craft services table as I was waiting between scenes. On the way into the "Y" at dark o'clock on Friday morning. I got to see this desplay. 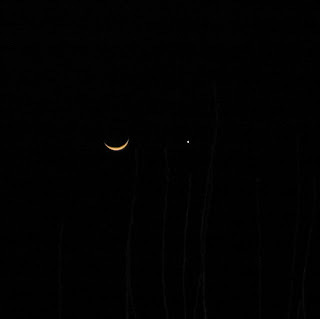 Venus was sitting atop the slice of moon about a hands worth...no clouds and no street lights to complicate the view.